Successfully Added Beautiful 3.0 Inch Touch Screen Cell Phone - Unlocked Bluetooth to your Shopping Cart. 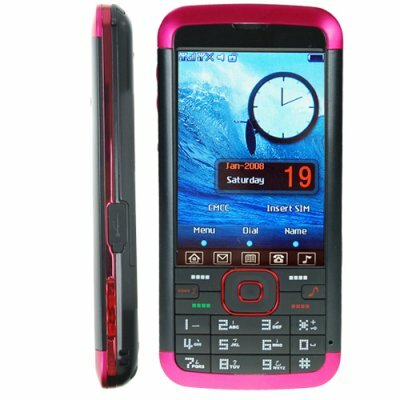 Dual SIM with dual standby 3.0 Inch Touch Screen Cell Phone having Dual Band GSM (900MHz, 1800MHz) capability. This unlocked touchscreen cellphone has strong modern media functions including Bluetooth A2DP and AVRCP. This comfortable to hold mobile phone includes a crisp 3.0 inch crisp view display and well thought out media features. The standout modern media features include the simple touch screen display and responsive keypad, WAP internet browser, MP4 player, MP3 player, FM radio, and general ease of use. Who is this phone good for? Do you need a reasonably priced, stylish mobilephone? Do you want to own a phone that has an extra large, easy to view screen? Then you have found your new cellular phone! This is also an especially good choice for people who like to read and surf the web with their phone, because the display is just so easy to view on this model. This unit is one of the few slim profile, easy to use dual SIM touchscreen phones you will find on the market today (in this price range). With its simple to dial keypad, touchscreen navigation and use, and big 3.0 inch display, this one is bound to be a big hit with your customers. Feature it on your internet storefront and see how many inquires this baby will generate for you! Slim Bluetooth cellphone with extra sharp 3.0 touchscreen display. This is a take out of the box, easy to use touch screen, two SIM, everyday use phone with style. NOTE1: This product is compatible with GSM at the frequencies of 900MHz and 1800MHz. Please check with your local provider if you are unsure of your local band requirement. NOTE2: We recommend not putting the phone into "Flight Mode". All in all, this product has awesome functionality, the pitfalls are the "engrish" manual is completely unreadable, to compound the grammar, the writing is in a cursive font that is in a very small size. Some of the menu items in the phone settings are a little bit cryptic to understand. And the battery life has been a bit disappointing, the extra battery supplied is an absolute necessity, and I would Rather have opted for a single 2400mah, or at least a 1500mah instead of 2 x 900mah, or perhaps I would put in a recommendation to the manufacturer to use a more common molex mini usb plug instead of the current one, so that the phones cable does not have to be carried around, to be plugged into any USB port for charging. If these, easily to ignore issues, are set aside, it is an awesome phone. Videos, which are correctly sized for that screen, play very well. The audio is clear at a reasonable volume. It supports the High density Micro SD Cards, so putting in a 4GB SD Card gave me a whole lot of space for MP3's and videos. With no effort (The media player does not like sub folders, all the mp3's have to be in the same folder). The USB2 interface is Fast and Works well in all selected modes (I would put in a recommendation to the manufacturers to have a default setting [webcam / mass storage / com port] so that it has the option of not having to be selected each time the phone is connected to usb, however that would be an extra feature, as it currently works perfectly fine. The call quality, signal strength, and dual sim are all flawless features. And works in Cyprus perfectly. The A2DP headset is one of the easiest setups I have ever seen, and works perfectly. The camera, even though it does not have a flash, takes excellent pictures, and works surprisingly well in low light conditions. This phone is highly recommended by me!